For the last twenty years or so, trainers have been drumming it into owners they must socialise their puppy with people and other dogs. In many puppy socialisation classes all the puppies are let off lead together so they can play. This sounds great in theory but in reality; some pups learn to be bullies and others learn to be victims. As your mother used to say; “It will all end in tears”. Along with this, access to the internet has mushroomed so people have much more information at their fingertips; some of this is good and some is not. Through best of intentions, owners (and also many trainers) think that they have to get their pup to meet every dog and every person that they come across; whether the pup wants to or not. Whilst this may seem perfectly logical in order to prevent behaviour problems later, why is it failing dogs so spectacularly? You will often hear puppy owners say things like “Look at that big doggie” or “Say hello nicely”, whilst simultaneously dragging their pup on the lead towards the other dog. They will rush up to random people and ask them to make a fuss of their pup and feed it treats so it learns to like people. If it were your child would you plonk it on a stranger’s knee and ask them to feed it sweeties in order to make it well mannered? People take their pup to the park which is fine, but they expect it to love all other dogs and want to endlessly play with them. Just because I am a human doesn’t mean I love ever other person on the planet; yet we think all dogs should love each other and therefor want to play together. Not so! This is Humphrey, aged 12wks, taking in the sights, sounds and smells of an exciting new world without being forced to greet anyone or anyone crowding him, this will set him on the right road to be a relaxed and happy adult dog. Dotty, on the other hand, was a little more ‘in your face’ as a puppy! For all that is known these days about the importance of early socialisation, why is it we are inadvertently creating little monsters? Barking and lunging on the lead, pestering other dogs to play, no recall and mugging people for food; behaviour problems are at an all-time high. You will have heard the expression “It’s not what you say; it’s the way that you say it.” Well it’s like that with puppy socialisation, “It’s not what you do; it’s the way that you do it”. Observing dogs in many different European cities, they accompany their owner, walk nicely on the lead, seeing other dogs, adults and children and yet are unreactive. Nothing seems to faze them and they take life in their stride. Although they are polite they can pass people and dogs without a burning desire to say hello, play or to back away in fear, this is because they don’t force their adorable puppies onto everybody and people don’t rush up to the puppies, insisting on a fuss without even waiting for a response from the owner, the puppies are simply accompanying their owner in exactly the same way that toddlers accompany their parents. Without a doubt, puppies do need early socialisation but in a far less obsessive way than we are doing now. We are currently putting too much pressure on them in our eagerness to get it right. Puppies are easily overwhelmed and can go into sensory overload because we are exposing them to too much, too quickly. Pups need much more space and time that we currently give them. They must be allowed time to absorb life at their own pace so they can and inwardly digest all the information they collect. Let them decide if they want to get closer to something or someone to investigate. If they look unsure or reticent to approach, take the hint and give them more space and time. In essence don’t try too hard; don’t be a pushy parent! In the park, by all means let them nod a quick hello to other dog but then to doff their cap and walk on by; metaphorically speaking of course. You need your dog to be polite but not constantly pestering other dogs to play; just as you don’t follow total strangers around in the street and ask them home for afternoon tea or a round of golf. Although it is important that we don’t push our puppies onto other people, it is also just as important that we learn to say ‘No’ when people are aiming for you at a rate of knots with eyes fixed onto your pup, often they will be all over the pup while saying they ‘absolutely MUST say hello’, you are then left feeling helpless until they have finished, you don’t need to feel you are being rude, just a polite, ‘not this time but thank you for asking’ and continue with your walk. This is the very reason that people then struggle for the next two years trying to stop their now, very boisterous pup, from jumping up at everyone, the pups/dogs don’t understand that what seemed normal when they were tiny, is not appropriate when they are 8 stone and covered in mud! We all know what it’s like to get lumbered with the party bore. Every way you turn they are in your face trying to get you to laugh at their distinctively unfunny jokes. Many pups can be likened to that party bore, they don’t take no for an answer. To add insult to injury the puppy owner shouts “He only wants to play”. Because we abdicate our responsibilities, we leave it to other people’s dogs to sort the problem out. The other dog eventually loses patience and may growl and show its teeth to get your pup to go away; worst case scenario a fight may ensue and your pup could get seriously injured. The villain of the piece was actually you, not the other dog. Sadly, this can be compounded by some well-meaning day care or dog walker who take groups of dogs out, sometimes up to 18-20 dogs may be racing around each other, all the dogs off the lead, seemingly having a fine old time, have a look at video clips on your dog walker/dog sitter’s website or Facebook page, how much rough play is there with dogs jumping all over each other? There may be little opportunity for a dog to have its own space because of the amount of excitement, this can lead to stress and when you then want to take your pup/dog out on your own, your dog seeks out the attention of other dogs or people, often leading to frustration while on the lead which may show as excessive pulling, barking, jumping up or biting at the lead, how insulting that your dog prefers the company of others to you! Your pup’s enjoyment should not be to the detriment of other park users, be they human or dog. 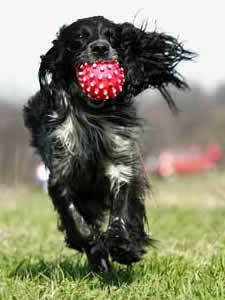 Take toys with you and have enjoyable games with your pup. Sorted! Humphrey and Dotty celebrating the first year of a perfectly polite friendship.